Discover the creativity that lies hidden within you - and express it! "Painting - because it is such a flexible and adaptable form of art - gives us unparalleled freedom to express what we are feeling. Through colors, forms, lines, even fabrics, we can tap into our deepest emotions and thoughts; we can access our very source. Given this opportunity, we unburden our spirits and are freed to express ourselves." - from the Introduction What can you learn about yourself through painting? How can a piece of artwork reflect your own personality, beliefs and values? How can touching brush to canvas help you portray something about yourself that is otherwise inexpressible? Delve into these questions and more in this imaginative, creative resource. 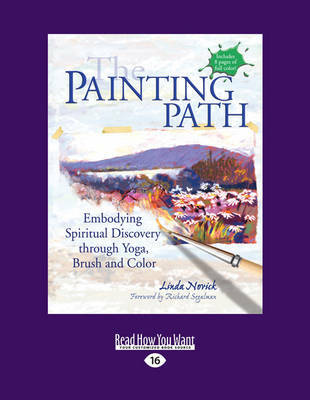 Professional artist and beloved teacher Linda Novick leads you on an exploration of the divine connection you can experience through art. Each chapter includes a simple yoga - inspired breathing and stretching exercise to focus your mind and refresh your body, along with an original art project that helps you explore a theme essential to both your creativity and your spirituality. Whether you're a painting novice or an accomplished artist, no matter your faith and background, this engaging book has a place for you. Experience the joy of unbridled creativity!